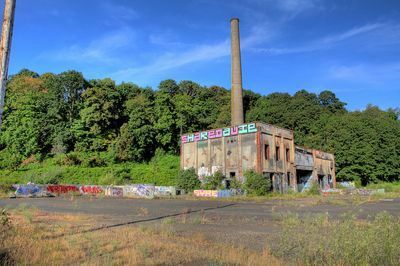 The cement industrial buildings on the edge of the river in North Portland have many names in Portland's grittier circles: Pirate Town, the Creosote Factory, the SuperFun site. But the well-known, heavily lead-contaminated hangout for both good and ill-natured debauchery is about to be resigned to nostalgia. University of Portland purchased the contaminated site, known officially as Triangle Park, and plans to swiftly demolish the buildings. In December, University of Portland bought the 35 acre stretch along the Willamette for $6 million. "This site will allow us to expand without going into the neighborhood," explains UofP's associate director of media relations John Furey. The University has not yet determined what they will use the ex-Pirate Town space for - maybe storage or an athletic field? Environmental problems at the Superfund site limit what they can build. But the university decided to tear down the old buildings and put up a fence around Triangle Park immediately because the school is legally liable for anything that happens their newly-acquired property. When I asked what day they plan to bulldoze the buildings, Furey replied, "I think they already have." "There is a real opportunity here to take blighted and contaminated industrial land and restore it under the stewardship of the University of Portland as a public asset," said University vice president Rev. Thomas Doyle at the time of the purchase. But for many Portland bicyclists, skateboarders and graffiti artists, the bizarre and lonely site was already a public asset. 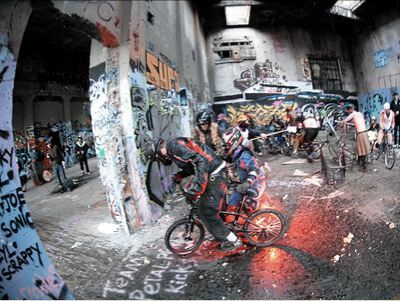 Bike punks held the epic Bicycle Chariot Wars there for five two years and screened vampire films on the former factory's creepy cement walls during midnight bike rides. The North Portland Sentinel ran a piece this summer about skater kids revamping Pirate Town, turning the space into a skatepark reminiscent of the early Burnside Bridge days. 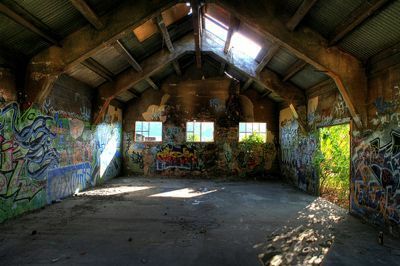 This video slideshow shows how skaters and graffiti artists used the building developers had abandoned for decades. The University definitely has reason to be concerned about legally dicey activities occurring at Pirate Town — the site was perfect for staging a whole range of illegal acts. "It's one of those places where there's no rules. A lot of good stuff happened there and a lot of bad stuff happened there," says Zander Speaks, who was photographing a friend doing parkour at Pirate Town last Friday. Two security guards arrived and informed Speaks (politely) that the long-unkept site was "an attractive nuisance" slated for demolition. "I'm perpetually frustrated by how society stomps out the places where people can create new things," laments Speaks. Portlander Zachary van Buuren confirms that Pirate Town is still standing... for now. Van Buuren heard the place was in its last days and headed down Tuesday afternoon to take some farewell photos of the buildings he often visits to check out interesting new graffiti. "It's one of the few places that graffiti artists can go to do their art and it's completely alright. It's a giant industrial canvas. I'm sad to see it go," says van Buuren. "These urban decay areas are gorgeous and every city needs them," says Gabe Tiller, perhaps the only person in Portland who rides a bike made from a coffin. But, Tiller concedes, "it was inevitable I guess. Fun while it lasted, and there are other great spots out there waiting to be found!"